The LiveLessons downloadables are up! « Knapp I.T. 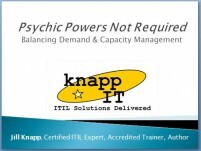 ← Need a copy of your ITIL Certification? The LiveLessons downloadables are up! So head on over to my ITIL 2011 LiveLessons Page right here on my website and see what stuff I have cookin’ for you there. Some items are free, and others cost money. The ITIL 2011 LiveLessons product was never designed to come with a workbook. My publisher told me to create the LiveLessons videos so they covered all exam topics, and that students would be expected to take notes. I made sure to emphasize those exam topics with that little red pencil symbol… so you’re all set! You were never under absolutely any obligation to purchase anything (other than access to the videos, of course) to be successful. But if you want to save time, well, that’s going to cost you. ;-) It took me a very long time to create these workbooks, and it cost me a lot of money to get them licensed, accredited, and approved. You absolutely don’t need these additional items, but I thought it would make your life easier so I created them for you. I gave you everything I could for free. But if it cost me to license it, create it, or to print it, I needed to charge for it. I’m confident when you see how huge these workbooks are, and how jam-packed the study-guide is, you’ll acknowledge they’re worth every penny. When you consider that most ITIL Foundation courses cost upwards of $1000/student, you’re getting quite a bargain by purchasing the videos plus a workbook and maybe a Study Guide. Those three things together give you everything my classroom students get when they book an in-person class with me… except you get to work at your own pace, and I don’t have to fly to you. Everyone wins! I’m so excited the marketplace is done and everything is signed and ready to go.